What Makes Health Records “Good”? Accurate and consistent health records, efficiently summarized, used to evaluate and inform management decisions on all dairies. This goal will be most rapidly realized along with improvements in cattle health if the dairy industry changes from ‘user-defined’ to standardized health data recording similar to current reproduction and milk production records. Most dairies are just a few small changes away from more useful, informative health records by following the 3 simple rules of good recording. 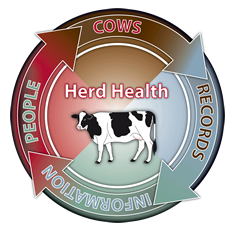 Learn what “Good Health Records” are, why dairies should have them and how easy they are to achieve. Assessment tools to see if your dairy has “Good Health Records” and if your treatment records are ‘good enough’ for the FDA. Veterinarian’s Guide and other resources to get started keeping “Good Health Records”. Who has “Good Health Records” in Washington and Idaho and examples “Good Health Records” being used to better inform health management decisions on dairies.